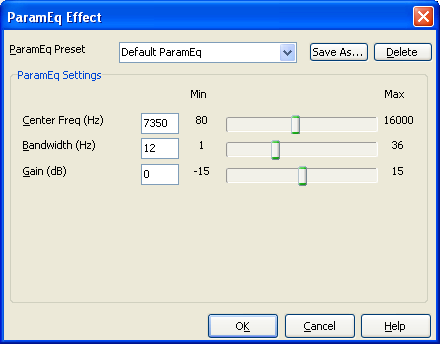 ParamEq FX is a parametric equalizer. Center frequency, in hertz. This value cannot exceed one-third of the frequency of the buffer. The default value is 8000. Bandwidth, in semitones. The default value is 12. Gain, The default value is 0. Submitted by Anonymous on Mon, 02/27/2017 - 16:49. Submitted by dffaas on Wed, 12/14/2016 - 19:14. Submitted by opla on Sat, 11/19/2016 - 20:59. Submitted by nina on Sat, 11/19/2016 - 20:50. Submitted by David on Wed, 08/31/2016 - 15:37. Reminded me of old times I studied at college and learned Delphi. Today new generation hear about this language only in the historical context and I work with students at The Term Papers Inc. never happened to get an order on Delphi unlike Python or C++.